After sending out some quotes from Ofsted reports in February’s Newsletter, Head teacher Hayley Adams created a quick Outdoor Learning Audit/Questionnaire. As she is my own HT, I have adapted the document further and made it available here.. It is in no way designed as a "OfSted are looking for..." document, but all the questions are based directly from Ofsted report quotes where Outdoor Learning and provision was mentioned specifically in the final report. For all the Ofsted quotes used take a look at my Newsletter for Feb. '16. I would value any thoughts and feedback. This is a project by the National Trust that has been running for some time. "What's 50 things all about? There's nothing quite like fresh air, exercise and family time. You can't beat the fun you have in the Great Outdoors and creating memories that will last a lifetime. But sometimes convincing your kids to get outside can be a bit of a struggle. That's why we've created '50 things to do before you're 11¾'. We want to encourage kids to get mucky, discover their wild side and most of all enjoy what Mother Nature has to offer!" 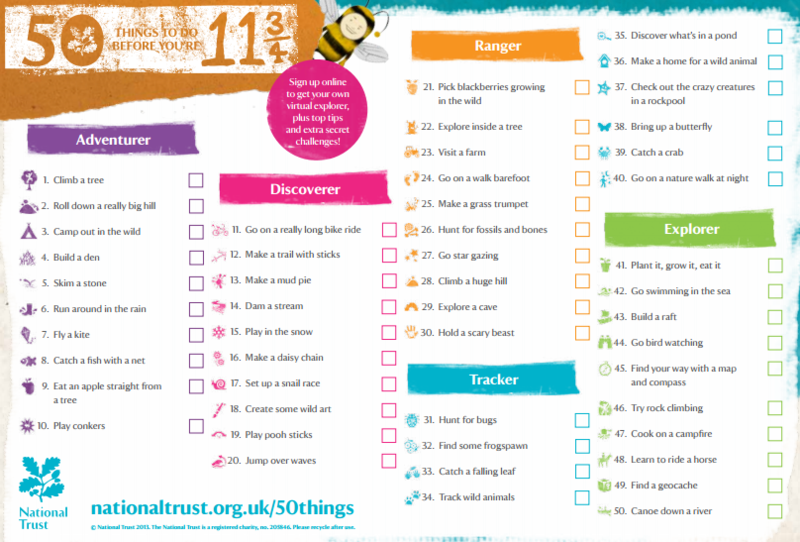 What a great set of challenges for children as part of holiday project or an In-School Challenge. My blog was picked up by The Wildlife Trust and has been included in their collection of blogs supporting The Every Child Wild project. It is pretty easy to make a simple kite from a bin bag, some dowel rods and string. ​March is often windy and cold, so take advantage of what nature gives you! You could be really clever and try to find your own stick and try with reeds or long grass, but the time may not be quite right for that yet. So much learning about forces, materials, design and redesign, as well as loads of fun too! Watch the video of children at a previous school taking over the beach for an afternoon... For some it was their first time at the beach, first time flying a kite and just a marvellous time! Over the summer, I went on lots of walks with my daughter and she really enjoyed our time walking through the woods, or along the side of the woods and investigating the hedgerows. She was especially interested in the blackberries and rosehips. This inspires this month’s outdoor idea. You could either go gathering with the children or bring them in to investigate. Pick lots and either then either slice, scoop out the contents and dry them or use them whole. Boil the water and boil the rosehips for around 5 mins until soft. Strain and remove the skins and lumps. Put back into the pan and add sugar to taste. ​Mix the starch and water, add this mixture into the soup and boil until thickened. As a child my Nan created a game now known by the name “Smell the Spices”, simply a memory game played by sniffing the many and varied contents of her herb and spice rack. Then remembering the contents using only the sense of smell. My Tyre-Herb Garden is very healthy at the moment and I love to go back in time by smelling the different herbs. Play the game with your class. Put the leaves of different herbs in cloth bags or glass jars. Cut leaves up to make the aroma stronger if you want – then challenge the children to match the smells to the plants. I find children from EYFS to Y6 love this game. You can use ginger, cinnamon, cloves and other exotic spices too. Can the children identify a given smell when the jars/bags are mixed up? I have always been fascinated by Terrariums (Plants in Bottles and Jars). As the weather has been unseasonably mild recently as well as ridiculously wet, spring plants are appearing all over the place! I have friends with daffodil in their gardens already. Take advantage of this phenomenon and create your own mini garden inside, in a jar or large glass bottle. Simple take a large jar and add a layer (1 - 1 1/2cm) of fine gravel and then a thicker layer of soil. I wouldn't use compost, I would use garden soil, there might be other interesting things in that soil, seeds, insects, fungi... you might be surprised! A few larger stones or smooth pebbles make it look interesting too. If you' rather have specialist soil, potting mix and charcoal make a good base. Choose your plant carefully. Ferns are quite hardy and work well, as do Starfish plants and Spider plants. Water it and seal it up - the jar should then contain the ecosystem and require no further support, until the plant outgrows the jar! Set the children a challenge: How long will their terrarium last? Will it last as long as David Latimer's? You can get clay pots quite cheaply, or recycle old and crack ones from the shed. Plastic ones work too, but I prefer the weight of clay. Tie a piece of garden string through the hole in the bottom of the pot. You can tie a big knot to block the hole, or use a cork, balled paper or other material to make sure the hole is blocked - a great opportunity to test material properties! The string should pass right through the pot. Melt a pack of lard in a bowl/saucepan and once liquid pour in a selection of seeds, raisins, nuts, meal-worms and or broken biscuit crumbs - tasty treats! Pour the mixture into the pot (this is why the hole needs to be covered!). Put it somewhere cool for a while to set. Spend some time collecting data on the birds that visit. Lots of graphs, charts, pictograms and data handling. Make a Bird feeder from an old Milk Carton. Rinse it thoroughly and cut the serving hatches and 3-5cm from the bottom. Experiment with ways to limit the amount of seeds that are served. You could add a stick perch or fold out the hole that you cut. otherwise close the top. Thread some string through the top and hang from your bird table. This would make a great Home Learning project, or Eco/Gardening Club activity. It’s October. Can you believe it?! Traditionally a month of drizzle and breezes. Why not link maths and the weather by making a simple anemometer with a thread, ping pong ball and a protractor. Tape the thread to the protractor so that it hangs down the 0 degree line. Tape or glue the other end of the thread to a ping pong ball and hang the whole device from a wall, fence or tree. 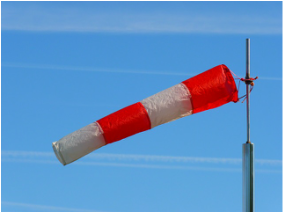 Children can now measure the strength of the wind by reading the angle. They could devise their own scale similar the Beaufort Scale. 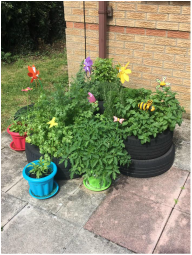 My daughter wanted to grow some herbs, so we planted up the tyres on the patio with Rosemary, Thyme, Basil, Mint, Parsley and Sage. Happily they all took off and have thrived. I now have far more herbs than I can use. The mint is especially fragrant, so how about picking, washing and drying the leaves, melting some dark chocolate and coating the leaves in chocolate? Once the the chocolate has cooled and hardened, peel off the leaves and you'll have some lovely home made mint chocolate! You can freeze them or keep them in the fridge if you need to stock up! Selected herbs, chillies, peppers, tomatoes & onions. Pick a blade of grass and hold it in between your thumbs like in this image from www.nwf.org. Bring your thumbs up to your mouth and blow! You might need a bit of practice, but very soon you will being playing all sorts of tunes! Can you play a tune your friends recognize? Can you play louder or quieter? Does the thickness of the grass make a difference to the sound? You can make red paint from St John's Wort. It has yellow flowers but crushing the buds will turn your fingers red! Soak the buds in a small amount of white vinegar and after a week or so the liquid will turn a dark red colour. What materials can you paint red? Can you find out why it is called St John's Wort? It's the end of the Easter break, the sun is coming out and even though Outdoor Learning takes place all year round, this is the time when the more reluctant teachers venture out of the classroom. I have been there, we all have. So this is a short post with a list of the resources I think are easy difference makers. Easy to find, easy to source, low cost and high impact. They are things that can be used with children of any age and for a diverse variety of learning experiences in different curriculum areas. Each item has multiple uses and applications and I am not in the business of patronising people - so I am not going to write a list. If you would like any suggestions - please feel free to ask. I am a big believer in collaboration - so if you have any ideas for Learning Outside the Classroom resources and are happy to share then please get in touch. If I include it on the website - you will be credited accordingly. I am in the process of developing a core set of ideas for taking the Classroom outside. 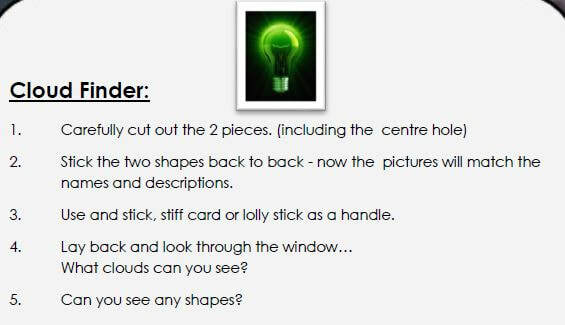 A set of simple and easier managed ideas that anyone can do whether their school is situated in the middle of a field or a concrete jungle in the centre of a city. I have taught in both and as much as possible this location-factor (L-Factor) should be as small a barrier as possible. While researching I have come across a selection of documents from a range of Local Education Authorities and Organisations. I make no remarks about quality or how up-to-date they may be, but I have stated the Source and approximate date in the title. "This study considers a range of leadership strategies that can be employed to successfully embed the use of the outdoors in children’s learning throughout their primary school education. Within the current context of the potential for greater flexibility in curriculum design, school leaders have the opportunity to exert greater influence over their particular school’s approach. This might include a greater emphasis on learning outdoors. Each of these is explored and tips for development are offered to the reader based on findings." "An example of a journey of discovery at two small federated schools in West Sussex as they utilise the rich resource of the outdoor environment to improve provision and engagement with pupils and learning. It illustrates the journey towards excellence and focuses on strategies to use the local environment to improve not only geography but also other subjects as part of an integrated approach to the curriculum." "At Courthouse Green Primary School, the outdoor area was designed specifically to provide high-quality learning experiences for purposeful, imaginative and creative play in the Early Years Foundation Stage." I am in the process of creating a gallery of Outdoor Learning Areas/Environments as a place to share practice. I want to create something more bespoke rather than just a collection of 'Googled' images. If you are willing to share the way you arrange your outdoor learning spaces, organise and access resources, offer a variety of learning experiences, then I would really love to hear from you. Images can be emailed or tweeted, links to school websites can be sent the same way or through the form on the Contacts Page. There is no need to send images of children (eSafety and all that) unless your school policies allow. I would like to be able to say where in the country (world?) you are too, so please let me know and all images will be credited. Images 14-22 - from #PrimEdChat - See Storify Below. Outdoor Learning at your School. What's stopping you? On Wednesday 18th March, I caught the end of the #PrimEdChat with the above title. Below you can follow the Storify and use it to find a collection of brilliant ideas/contacts to raise the profile of Learning Outside the Classroom. From Andy Goldsworthy Natural Art to Mathematical Arrays using shells and construction and gardening with old car tyres - there is a fab resource right here. Thanks to @PrimEdChat for letting me create and share.